The sestertius (plural sestertii), or sesterce (plural sesterces), was an ancient Roman coin. During the Roman Republic it was a small, silver coin issued only on rare occasions. During the Roman Empire it was a large brass coin. The name sestertius means "two and one half", referring to its nominal value of two and a half asses (a bronze Roman coin, singular as), a value that was useful for commerce because it was one quarter of a denarius, a coin worth ten asses. The name is derived from semis, "half" and "tertius", "third", in which "third" refers to the third as: the sestertius was worth two full asses and half of a third. English-language sources routinely use the original Latin form sestertius, plural sestertii; but older literature frequently uses sesterce, plural sesterces, terce being the English equivalent of tertius. A modern shorthand for values in sestertii is IIS (Unicode 𐆘), in which the Roman numeral II is followed by S for semis, and the whole struck through; but because this symbol and striking through letters are not always convenient, HS may be used instead, with the horizontal bar of the 'H' representing the strike through the numeral II, rather than the letter H.
The sestertius was introduced c. 211 BC as a small silver coin valued at one-quarter of a denarius (and thus one hundredth of an aureus). A silver denarius was supposed to weigh about 4.5 grams, valued at ten grams, with the silver sestertius valued at two and one-half grams. 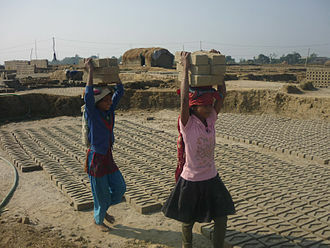 In practice, the coins were usually underweight. When the denarius was retariffed to sixteen asses (due to the gradual reduction in the size of bronze denominations), the sestertius was accordingly revalued to four asses, still equal to one quarter of a denarius. It was produced sporadically, far less often than the denarius, through 44 BC. In or about 23 BC, with the coinage reform of Augustus, the sestertius was reintroduced as a large brass denomination. While the as, now made of copper, was worth 1/4 of a sestertius. 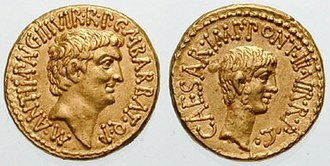 Augustus tariffed the value of the sestertius as 1/100 gold aureus. The sestertius was produced as the largest brass denomination until the late 3rd century AD. Most were struck in the mint of Rome but from AD 64 during the reign of Nero (AD 54–68) and Vespasian (AD 69–79), the mint of Lyon (Lugdunum), supplemented production. 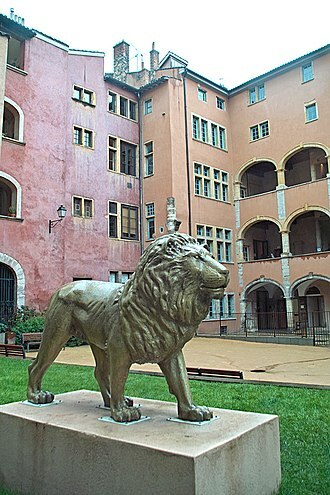 Lyon sestertii can be recognised by a small globe, or legend stop, beneath the bust. The brass sestertius typically weighs in the region of 25 to 28 grammes, is around 32–34 mm in diameter and about 4 mm thick. The distinction between bronze and brass was important to the Romans. Their name for brass was orichalcum, also spelled aurichalcum (echoing the word for a gold coin, aureus), meaning 'gold-copper', because of its shiny, gold-like appearance when the coins were newly struck (see, for example Pliny the Elder in his Natural History Book 34.4). Orichalcum was considered, by weight, to be about double the value of copper. This is why the half-sestertius, the dupondius, was around the same size and weight as the bronze was, but was worth two asses. Sestertii continued to be struck until the late 3rd century, although there was a marked deterioration in the quality of the metal used and the striking even though portraiture remained strong. 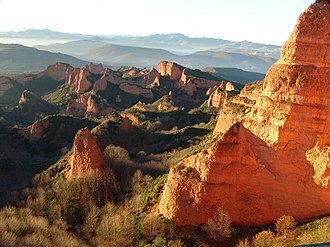 Later emperors increasingly relied on melting down older sestertii, a process which led to the zinc component being gradually lost as it burned off in the high temperatures needed to melt copper (zinc melts at 419 °C but boils at 907 °C, copper melts at 1085 °C). The shortfall was made up with bronze and even lead. Later sestertii tend to be darker in appearance as a result and are made from more crudely prepared blanks (see the Hostilian coin on this page). The gradual impact of inflation caused by debasement of the silver currency meant that the purchasing power of the sestertius and smaller denominations like the dupondius and as was steadily reduced. In the 1st century AD, everyday small change was dominated by the dupondius and as, but in the 2nd century, as inflation bit, the sestertius became the dominant small change. In the 3rd century silver coinage contained less and less silver, and more and more copper or bronze. By the 260s and 270s the main unit was the double-denarius, the Antoninianus, but by then these small coins were almost all bronze. Although these coins were theoretically worth eight sestertii, the average sestertius was worth far more in plain terms of the metal it contained. Some of the last sestertii were struck by Aurelian (270–275 AD). During the end of its issue, when sestertii were reduced in size and quality, the double sestertius was issued first by Trajan Decius (249–251 AD) and later in large quantity by the ruler of a breakaway regime in the West, named Postumus (259–268 AD), who often used worn old sestertii to overstrike his image and legends on. The double sestertius was distinguished from the sestertius by the radiate crown worn by the emperor, a device used to distinguish the dupondius from the as and the Antoninianus from the denarius. Eventually, the inevitable happened. 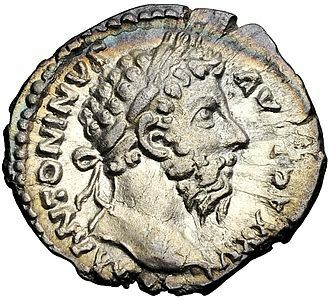 Many sestertii were withdrawn by the state and by forgers, to melt down to make the debased Antoninianus, which made inflation worse. In the coinage reforms of the 4th century, the sestertius played no part and passed into history. The sestertius was also used as a standard unit of account and was represented on inscriptions with the monogram HS. Large values were recorded in terms of sestertium milia, thousands of sestertii, with the milia often omitted and implied. The wealthy general and politician of the late Roman Republic, Crassus, who fought in the war to defeat Spartacus, was said by Pliny the Elder to have had "estates worth 200 million sesterces". A loaf of bread cost roughly half a sestertius, and a sextarius (c. 0.5 L) of wine anywhere from less than half to more than one sestertius. One modius (6.67 kg) of wheat in 79 AD Pompeii cost seven sestertii, of rye three sestertii, a bucket two sestertii, a tunic fifteen sestertii, a donkey five hundred sestertii. According to Tacitus' Annals, book I, chapter 17.4 and 17.5, soldiers of the Rhine army, who rose against Tiberius were paid ten asses a day of which they had to pay, among other things, their own uniforms. They demanded to be paid a denarius a day, and they got it. Records from Pompeii show a slave being sold at auction for 6,252 sestertii. A writing tablet from Londinium (Roman London), dated to c. 75–125 AD, records the sale of a Gallic slave girl called Fortunata for 600 denarii, equal to 2,400 sestertii, to a man called Vegetus. 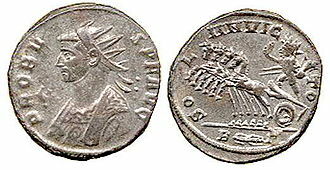 It is difficult to make any comparisons with modern coinage or prices, but for most of the 1st century AD, the ordinary legionary was paid nine hundred sestertii per annum, rising to twelve hundred under Domitian (81–96 AD), the equivalent of 3.3 sestertii per day. Half of it was deducted for living costs, leaving the soldier, if he was lucky enough to get paid, with about 1.65 sestertii per day. Sestertii are highly valued by numismatists, since their large size gave caelatores (engravers) a large area in which to produce detailed portraits and reverse types. The most celebrated are those produced for Nero (54–68 AD) between the years 64 and 68 AD, created by some of the most accomplished coin engravers in history. The brutally realistic portraits of this emperor, and the elegant reverse designs, greatly impressed and influenced the artists of the Renaissance. 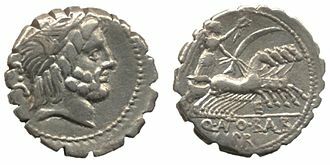 The series issued by Hadrian (117–138 AD), recording his travels around the Roman Empire, depicts the Empire at its height, and included the first representation on a coin of the figure of Britannia; centuries later it was revived by English king Charles II, and continues to feature on the United Kingdom coinage. As a result of ceasing production and withdrawals from circulation in the 4th century, sestertii are less common as a whole compared to other Roman bronze coins. 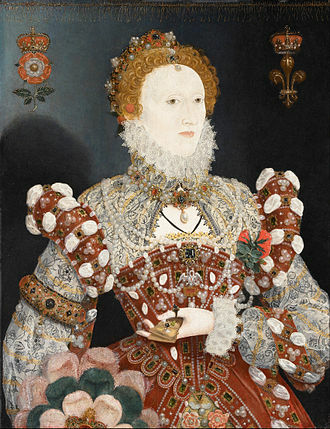 Fully struck examples with sharp detail often command high premiums at auction. The Asterix comic series often mentions prices in sestertii. ^ Kennedy, Benjamin Hall (1930). The Revised Latin Primer. London: Longmans. p. 214. ^ Tacitus, Annales 1.17.4 and 1.17.5: Enimvero militiam ipsam gravem, infructuosam: denis in diem assibus animam et corpus aestimari: hinc vestem arma tentoria, hinc saevitiam centurionum et vacationes munerum redimi. At hercule verbera et vulnera, duram hiemem, exercitas aestates, bellum atrox: aut sterilem pacem sempiterna) Nec aliud levamentum quam si certis sub legibus militia iniretur, ut singulos denarios mererent, sextus decumus stipendii annus finem adferret, ne ultra sub vexillis tenerentur, sed isdem in castris praemium pecunia solveretur. ^ Sear, David R. (1981). 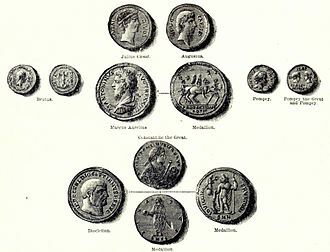 Roman Coins and their Values. London: Seaby. pp. 10–12. ISBN 0-900652-57-8. 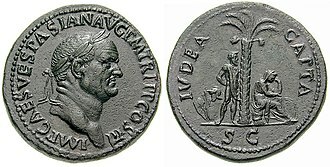 Wikimedia Commons has media related to Sestertius. Tiberius was a Roman Emperor from 14 AD to 37 AD. Born Tiberius Claudius Nero, a Claudian, Tiberius was the son of Tiberius Claudius Nero and his mother divorced Nero and married Octavian, known as Augustus, in 39 BC, making him a step-son of Octavian. Tiberius would marry Augustus daughter, Julia the Elder, and even be adopted by Augustus, by which act he officially became a Julian, bearing the name Tiberius Julius Caesar. The subsequent emperors after Tiberius would continue this blended dynasty of both families for the thirty years, historians have named it the Julio-Claudian dynasty. In relations to the emperors of this dynasty, Tiberius was the stepson of Augustus, grand-uncle of Caligula, paternal uncle of Claudius. Tiberius was one of Romes greatest generals, his conquest of Pannonia, Dalmatia and temporarily, parts of Germania, laid the foundations for the northern frontier. But he came to be remembered as a dark and sombre ruler who never really desired to be emperor, Pliny the Elder called him tristissimus hominum, after the death of Tiberius’ son Drusus Julius Caesar in 23 AD, he became more reclusive and aloof. In 26 AD Tiberius removed himself from Rome and left largely in the hands of his unscrupulous Praetorian Prefects Lucius Aelius Sejanus and Quintus Naevius Sutorius Macro. Caligula, Tiberius grand-nephew and adopted grandson, succeeded Tiberius upon his death, Tiberius was born in Rome on 16 November 42 BC to Tiberius Claudius Nero and Livia Drusilla. In 39 BC his mother divorced his father and remarried Gaius Julius Caesar Octavianus shortly thereafter. In 38 BC his brother, Nero Claudius Drusus, was born, little is recorded of Tiberiuss early life. In 32 BC Tiberius at the age of nine, delivered the eulogy for his father at the rostra. In 29 BC, both he rode in the chariot along with their adoptive father Octavian in celebration of the defeat of Antony. In 23 BC Emperor Augustus became gravely ill and his possible death threatened to plunge the Roman world into chaos again, in response, a series of potential heirs seem to have been selected, among them Tiberius and his brother Drusus. Similar provisions were made for Drusus, shortly thereafter Tiberius began appearing in court as an advocate, and it is presumably here that his interest in Greek rhetoric began. Gold is a chemical element with symbol Au and atomic number 79. In its purest form, it is a bright, slightly yellow, soft, malleable. Chemically, gold is a metal and a group 11 element. It is one of the least reactive chemical elements and is solid under standard conditions, Gold often occurs in free elemental form, as nuggets or grains, in rocks, in veins, and in alluvial deposits. It occurs in a solid solution series with the element silver and naturally alloyed with copper. Less commonly, it occurs in minerals as gold compounds, often with tellurium, golds atomic number of 79 makes it one of the higher numbered, naturally occurring elements. It is thought to have produced in supernova nucleosynthesis, from the collision of neutron stars. Because the Earth was molten when it was formed, almost all of the present in the early Earth probably sank into the planetary core. 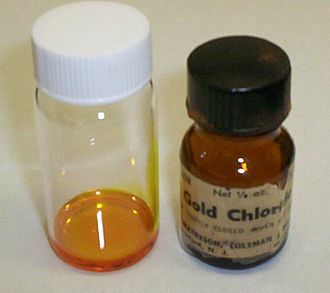 Gold is resistant to most acids, though it does dissolve in aqua regia, a mixture of acid and hydrochloric acid. Gold dissolves in solutions of cyanide, which are used in mining and electroplating. Gold dissolves in mercury, forming amalgam alloys, but this is not a chemical reaction, as a precious metal, gold has been used for coinage and other arts throughout recorded history. A total of 186,700 tonnes of gold is in existence above ground, the world consumption of new gold produced is about 50% in jewelry, 40% in investments, and 10% in industry. Gold is used in infrared shielding, colored-glass production, gold leafing, certain gold salts are still used as anti-inflammatories in medicine. 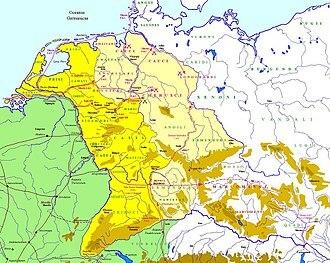 As of 2014, the worlds largest gold producer by far was China with 450 tonnes, Gold is cognate with similar words in many Germanic languages, deriving via Proto-Germanic *gulþą from Proto-Indo-European *ǵʰelh₃-. The symbol Au is from the Latin, the Latin word for gold, the Proto-Indo-European ancestor of aurum was *h₂é-h₂us-o-, meaning glow. This word is derived from the root as *h₂éu̯sōs, the ancestor of the Latin word Aurora. This etymological relationship is presumably behind the frequent claim in scientific publications that aurum meant shining dawn, Gold is the most malleable of all metals, a single gram can be beaten into a sheet of 1 square meter, and an avoirdupois ounce into 300 square feet. Vespasian was Roman emperor from AD69 to AD79. Vespasian founded the Flavian dynasty that ruled the Empire for twenty-seven years, Vespasian was from an equestrian family that rose into the senatorial rank under the Julio–Claudian emperors. While Vespasian besieged Jerusalem during the Jewish rebellion, emperor Nero committed suicide, after Galba and Otho perished in quick succession, Vitellius became the third emperor in April 69. The Roman legions of Roman Egypt and Judaea reacted by declaring Vespasian, their commander, emperor on 1 July 69. In his bid for power, Vespasian joined forces with Mucianus, the governor of Syria, and Primus. Primus and Mucianus led the Flavian forces against Vitellius, while Vespasian took control of Egypt, on 20 December 69, Vitellius was defeated, and the following day Vespasian was declared Emperor by the Senate. Little information survives about the government during Vespasians ten-year rule and he reformed the financial system at Rome after the campaign against Judaea ended successfully, and initiated several ambitious construction projects. 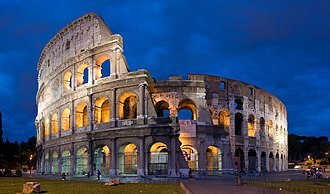 He began the building of the Flavian Amphitheatre, better known today as the Roman Colosseum, in reaction to the events of 68–69, Vespasian forced through an improvement in army discipline. Through his general Agricola, Vespasian increased imperial expansion in Britain, after his death in 79, he was succeeded by his eldest son Titus, thus becoming the first Roman Emperor to be directly succeeded by his own natural son and establishing the Flavian dynasty. Vespasian was born in a village north-east of Rome called Falacrinae and his family was relatively undistinguished and lacking in pedigree. His paternal grandfather, Titus Flavius Petro, became the first to himself, rising to the rank of centurion. Subsequently he became a debt collector, petros son, Titus Flavius Sabinus, worked as a customs official in the province of Asia and became a money-lender on a small scale among the Helvetii. He gained a reputation as a scrupulous and honest tax-farmer, Sabinus married up in status, to Vespasia Polla, whose father had risen to the rank of prefect of the camp and whose brother became a Senator. Nero was Roman Emperor from 54 to 68, and the last in the Julio-Claudian dynasty. Nero was adopted by his great-uncle Claudius to become his heir and successor, during his reign, the redoubtable general Corbulo conducted a successful war and negotiated peace with the Parthian Empire. 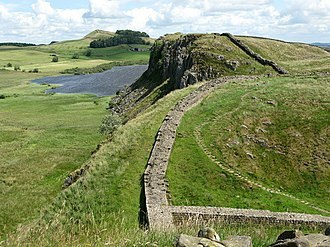 His general Suetonius Paulinus crushed a revolt in Britain, Nero annexed the Bosporan Kingdom to the empire and may have begun the First Jewish–Roman War. In 64 AD, most of Rome was destroyed in the Great Fire of Rome, writing a generation later, claims that many Romans believed Nero himself had started the fire, in order to clear land for his planned palatial complex, the Domus Aurea. In 68, the rebellion of Vindex in Gaul and the acclamation of Galba in Hispania drove Nero from the throne, facing a false report of being denounced as a public enemy who was to be executed, he committed suicide on 9 June 68. His death ended the Julio-Claudian dynasty, sparking a period of civil wars known as the Year of the Four Emperors. Neros rule is often associated with tyranny and extravagance and he is known for many executions, including that of his mother, and the probable murder by poison of his stepbrother Britannicus. Nero was rumored to have had captured Christians dipped in oil and this view is based on the writings of Tacitus and Cassius Dio, the main surviving sources for Neros reign, but a few sources paint Nero in a more favourable light. Some sources, including some mentioned above, portray him as an emperor who was popular with the common Roman people, some modern historians question the reliability of ancient sources when reporting on Neros tyrannical acts. Lucius Domitius Ahenobarbus, was born on 15 December 37 in Antium and he was the only son of Gnaeus Domitius Ahenobarbus and Agrippina the Younger, sister of Emperor Caligula. Neros father, was the son of Lucius Domitius Ahenobarbus, Gnaeus was thus the grandson of Gnaeus Domitius Ahenobarbus and probably Aemilia Lepida on his fathers side, and the grandson of Mark Antony and Octavia Minor on his mothers side. Copper is a chemical element with symbol Cu and atomic number 29. It is a soft and ductile metal with high thermal and electrical conductivity. A freshly exposed surface of copper has a reddish-orange color. Copper is one of the few metals that occur in nature in directly usable metallic form as opposed to needing extraction from an ore and this led to very early human use, from c.8000 BC. Copper used in buildings, usually for roofing, oxidizes to form a green verdigris, Copper is sometimes used in decorative art, both in its elemental metal form and in compounds as pigments. Copper compounds are used as agents and wood preservatives. 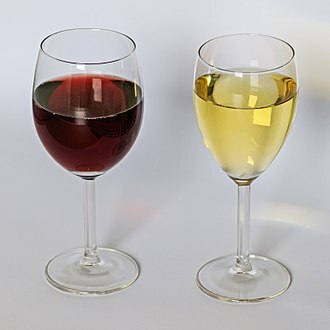 Copper is essential to all living organisms as a trace dietary mineral because it is a key constituent of the enzyme complex cytochrome c oxidase. In molluscs and crustaceans, copper is a constituent of the blood pigment hemocyanin, replaced by the hemoglobin in fish. In humans, copper is found mainly in the liver, the adult body contains between 1.4 and 2.1 mg of copper per kilogram of body weight. The filled d-shells in these elements contribute little to interatomic interactions, unlike metals with incomplete d-shells, metallic bonds in copper are lacking a covalent character and are relatively weak. 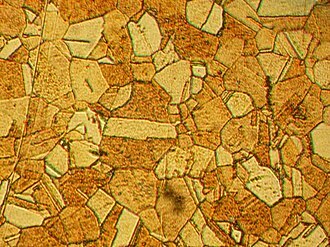 This observation explains the low hardness and high ductility of single crystals of copper, at the macroscopic scale, introduction of extended defects to the crystal lattice, such as grain boundaries, hinders flow of the material under applied stress, thereby increasing its hardness. For this reason, copper is supplied in a fine-grained polycrystalline form. The softness of copper partly explains its high conductivity and high thermal conductivity. The maximum permissible current density of copper in open air is approximately 3. 1×106 A/m2 of cross-sectional area, Copper is one of a few metallic elements with a natural color other than gray or silver. Pure copper is orange-red and acquires a reddish tarnish when exposed to air, as with other metals, if copper is put in contact with another metal, galvanic corrosion will occur. 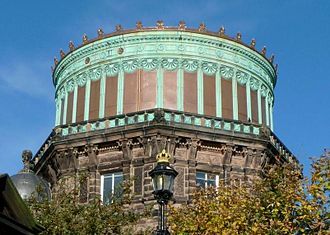 A green layer of verdigris can often be seen on old structures, such as the roofing of many older buildings. Rye is a grass grown extensively as a grain, a cover crop and a forage crop. It is a member of the tribe and is closely related to barley. Rye grain is used for flour, rye bread, rye beer, crisp bread, some whiskeys, some vodkas and it can be eaten whole, either as boiled rye berries or by being rolled, similar to rolled oats. Rye is a grain and should not be confused with ryegrass, which is used for lawns, pasture. Rye is one of a number of species grow wild in central and eastern Turkey. 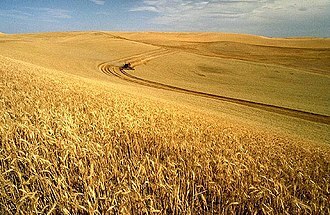 It is possible that rye traveled west from Turkey as an admixture in wheat. Since the Middle Ages people have cultivated rye widely in Central and it serves as the main bread cereal in most areas east of the French-German border and north of Hungary. 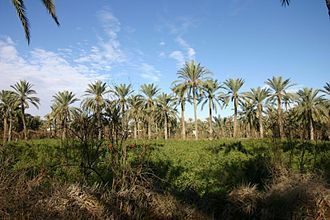 In Southern Europe, it was cultivated on marginal lands, claims of much earlier cultivation of rye, at the Epipalaeolithic site of Tell Abu Hureyra in the Euphrates valley of northern Syria remain controversial. Critics point to inconsistencies in the dates, and identifications based solely on grain. Winter rye is any breed of rye planted in the fall to provide cover for the winter. It grows during warmer days of the winter when sunlight temporarily warms the plant above freezing and it is sometimes used in winter gardens and is a common nurse crop. Rye is grown primarily in Eastern and Northern Europe, the main rye belt stretches from northern Germany through Poland, Belarus and Latvia into central and northern Russia. Rye is grown in North America, in South America, in Oceania, in Turkey, in Kazakhstan, production levels of rye have fallen in most of the producing nations, as of 2012. For instance, production of rye in Russia fell from 13.9 million metric tons in 1992 to 2.1 t in 2012, most rye is consumed locally or exported only to neighboring countries, rather than being shipped worldwide. Rye is highly susceptible to the ergot fungus, consumption of ergot-infected rye by humans and animals results in a serious medical condition known as ergotism. Ergotism can cause physical and mental harm, including convulsions, necrosis of digits, hallucinations. Antoninus Pius, known as Antoninus, was Roman Emperor from 138 to 161. 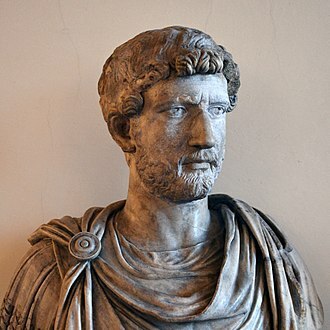 He was one of the Five Good Emperors in the Nerva–Antonine dynasty and he died of illness in 161 and was succeeded by his adopted sons Marcus Aurelius and Lucius Verus as co-emperors. He was born as the child of Titus Aurelius Fulvus. The Aurelii Fulvii were therefore a new senatorial family from Gallia Narbonensis whose rise to prominence was supported by the Flavians. The link between Antoninus family and their home province explains the importance of the post of Proconsul of Gallia Narbonensis during the late Second Century. Antoninus was born near Lanuvium and his mother was Arria Fadilla, the Arrii Antoninii were an older senatorial family from Italy, very influential during Nervas reign. 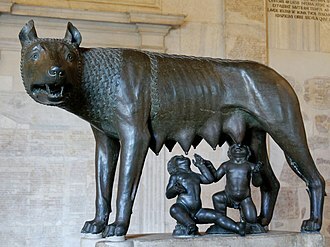 Arria Fadilla, Antoninus mother, married afterwards Publius Julius Lupus, a man of rank, suffect consul in 98. Some time between 110 and 115, Antoninus married Annia Galeria Faustina the Elder and they are believed to have enjoyed a happy marriage. Faustina was the daughter of consul Marcus Annius Verus and Rupilia Faustina, Faustina was a beautiful woman, and despite rumours about her character, it is clear that Antoninus cared for her deeply. Faustina bore Antoninus four children, two sons and two daughters and they were, Marcus Aurelius Fulvus Antoninus, his sepulchral inscription has been found at the Mausoleum of Hadrian in Rome. Marcus Galerius Aurelius Antoninus, his sepulchral inscription has been found at the Mausoleum of Hadrian in Rome and his name appears on a Greek Imperial coin. Aurelia Fadilla, she married Lucius Lamia Silvanus, consul 145 and she appeared to have no children with her husband and her sepulchral inscription has been found in Italy. Annia Galeria Faustina Minor or Faustina the Younger, a future Roman Empress, married her maternal cousin, when Faustina died in 141, Antoninus was greatly distressed. In honour of her memory, he asked the Senate to deify her as a goddess and he had various coins with her portrait struck in her honor. Marcus Cassianius Latinius Postumus was a Roman commander of provincial origin who ruled as emperor in the west. He ruled for the part of ten years before he was murdered by his own troops. Little is known about the life of Postumus. He has been claimed as a Batavian, certainly his coinage honours deities—Hercules Magusanus, Hercules Magusanus was probably an interpretatio romana translation of the Germanic deity Donar. 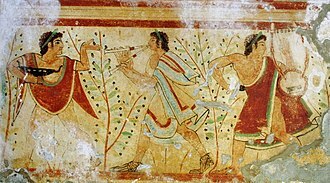 Deusoniensis may refer to the town of Deuso, located in or near Batavian territory and likely to be identified with Diessen, from these relatively obscure provincial origins, Postumus would have risen through the ranks of the army until he held command of the Roman forces among the Celts. What his precise title was is not definitely known, though he may plausibly have been promoted by the emperor Valerian to the position of imperial legate of Lower Germany, Postumus was evidently in favour at court, according to König, was granted an honorary consulship. By 259, Valerian was campaigning in the east against the Persians, while his son, Gallienus left his son and military commanders, including Postumus, to protect the Rhine. Amid the chaos of an invasion by the Alamanni and Franks, and spurred on by news of the defeat and capture of Valerian, the army in Gaul revolted and proclaimed Postumus emperor. The trigger was their defeat in 260 of a Juthungian army which was returning from Italy laden with prisoners, under the command of Postumus and Marcus Simplicinius Genialis, the Roman army crushed the Juthungi, and Postumus proceeded to distribute the captured spoils to the legions he commanded. Saloninus, on the advice of his praetorian prefect Silvanus, demanded the transfer of the booty to his residence at Colonia Claudia Ara Agrippinensium. Postumus assembled his army and made a show of reluctantly enforcing this command, the troops accordingly proclaimed Postumus emperor and proceeded to besiege and attack Colonia Claudia Ara Agrippinensium, trapping Saloninus and Silvanus. After breaching the walls of the city, Postumus had Silvanus and Saloninus killed, Later he erected a triumphal arch to celebrate his victory. Lead is a chemical element with atomic number 82 and symbol Pb. 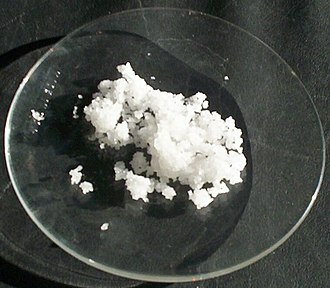 When freshly cut, it is bluish-white, it tarnishes to a dull gray upon exposure to air and it is a soft and heavy metal with a density exceeding that of most common materials. Lead has the second-highest atomic number of the stable elements. Lead is a relatively unreactive post-transition metal and its weak metallic character is illustrated by its amphoteric nature and tendency to form covalent bonds. Compounds of lead are found in the +2 oxidation state. Exceptions are mostly limited to organolead compounds, like the lighter members of the group, lead exhibits a tendency to bond to itself, it can form chains and polyhedral structures. 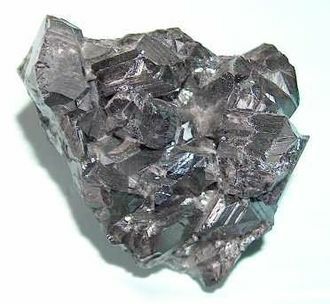 Lead is easily extracted from its ores and was known to people in Western Asia. A principal ore of lead, often bears silver, Lead production declined after the fall of Rome and did not reach comparable levels again until the Industrial Revolution. Nowadays, global production of lead is about ten million tonnes annually, Lead has several properties that make it useful, high density, low melting point and relative inertness to oxidation. In the late 19th century, lead was recognized as poisonous, Lead is a neurotoxin that accumulates in soft tissues and bones, damaging the nervous system and causing brain disorders and, in mammals, blood disorders. A lead atom has 82 electrons, arranged in a configuration of 4f145d106s26p2. The combined first and second ionization energies—the total energy required to remove the two 6p electrons—is close to that of tin, leads upper neighbor in group 14. This is unusual since ionization energies generally fall going down a group as an elements outer electrons become more distant from the nucleus, the similarity is caused by the lanthanide contraction—the decrease in element radii from lanthanum to lutetium, and the relatively small radii of the elements after hafnium. The contraction is due to shielding of the nucleus by the lanthanide 4f electrons. The combined first four ionization energies of lead exceed those of tin, for this reason lead, unlike tin, mostly forms compounds in which it has an oxidation state of +2, rather than +4. Augustus was the founder of the Roman Principate and considered the first Roman emperor, controlling the Roman Empire from 27 BC until his death in AD14. He was born Gaius Octavius into an old and wealthy equestrian branch of the plebeian gens Octavia and his maternal great-uncle Julius Caesar was assassinated in 44 BC, and Octavius was named in Caesars will as his adopted son and heir, known as Octavianus. He, Mark Antony, and Marcus Lepidus formed the Second Triumvirate to defeat the assassins of Caesar, following their victory at the Battle of Philippi, the Triumvirate divided the Roman Republic among themselves and ruled as military dictators. The Triumvate was eventually torn apart by the ambitions of its members. Lepidus was driven into exile and stripped of his position, in reality, however, he retained his autocratic power over the Republic as a military dictator. 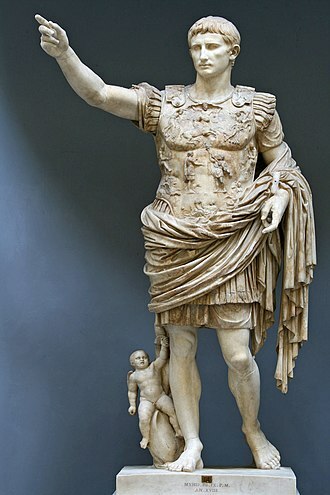 By law, Augustus held a collection of powers granted to him for life by the Senate, including supreme military command, and it took several years for Augustus to develop the framework within which a formally republican state could be led under his sole rule. He rejected monarchical titles, and instead called himself Princeps Civitatis, the resulting constitutional framework became known as the Principate, the first phase of the Roman Empire. The reign of Augustus initiated an era of peace known as the Pax Romana. Augustus dramatically enlarged the Empire, annexing Egypt, Pannonia and Raetia, expanding possessions in Africa, expanding into Germania, beyond the frontiers, he secured the Empire with a buffer region of client states and made peace with the Parthian Empire through diplomacy. Augustus died in AD14 at the age of 75 and he probably died from natural causes, although there were unconfirmed rumors that his wife Livia poisoned him. He was succeeded as Emperor by his adopted son Tiberius, Augustus was known by many names throughout his life, At birth, he was named Gaius Octavius after his biological father. Historians typically refer to him simply as Octavius between his birth in 63 until his adoption by Julius Caesar in 44 BC, upon his adoption, he took Caesars name and became Gaius Julius Caesar Octavianus in accordance with Roman adoption naming standards. 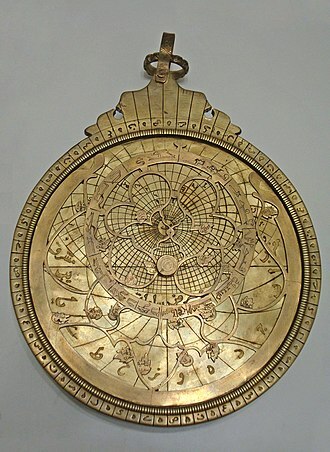 Brass is a metal alloy made of copper and zinc, the proportions of zinc and copper can be varied to create a range of brasses with varying properties. It is an alloy, atoms of the two constituents may replace each other within the same crystal structure. By comparison, bronze is principally an alloy of copper and tin, however and brass may include small proportions of a range of other elements including arsenic, aluminium and silicon. The term is applied to a variety of brasses. Modern practice in museums and archaeology increasingly avoids both terms for objects in favour of the all-embracing copper alloy. It is used in zippers, Brass is often used in situations in which it is important that sparks not be struck, such as in fittings and tools used near flammable or explosive materials. Brass has higher malleability than bronze or zinc, the relatively low melting point of brass and its flow characteristics make it a relatively easy material to cast. By varying the proportions of copper and zinc, the properties of the brass can be changed, allowing hard, the density of brass is 8.4 to 8.73 grams per cubic centimetre. Today, almost 90% of all alloys are recycled. Because brass is not ferromagnetic, it can be separated from ferrous scrap by passing the scrap near a powerful magnet, Brass scrap is collected and transported to the foundry where it is melted and recast into billets. Billets are heated and extruded into the form and size. The general softness of brass means that it can often be machined without the use of cutting fluid, aluminium makes brass stronger and more corrosion-resistant. Aluminium causes a highly beneficial hard layer of oxide to be formed on the surface that is thin, transparent. Tin has an effect and finds its use especially in seawater applications. Combinations of iron, aluminium and manganese make brass wear and tear resistant, to enhance the machinability of brass, lead is often added in concentrations of around 2%. Since lead has a melting point than the other constituents of the brass. The pattern the globules form on the surface of the brass increases the available surface area which in turn affects the degree of leaching. Fragmentary remains of the Temple of Castor and Pollux in Rome. Silver is extremely ductile, and can be drawn into a wire one atom wide. 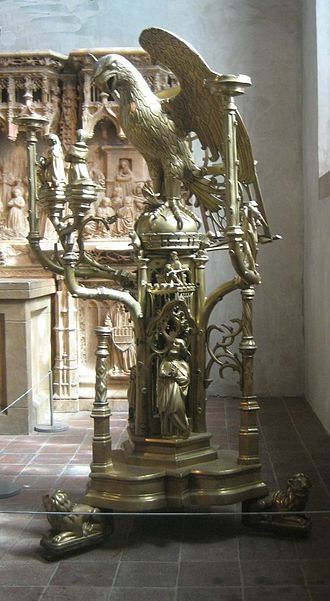 Brass lectern with an eagle. Attributed to Aert van Tricht, Limburg (Netherlands), c. 1500. 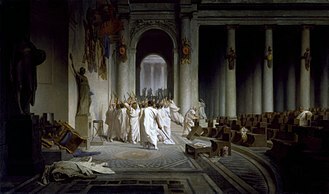 The Death of Caesar, by Jean-Léon Gérôme (1867). On 15 March 44 BC, Octavius' adoptive father Julius Caesar was assassinated by a conspiracy led by Marcus Junius Brutus and Gaius Cassius Longinus. Walters Art Museum, Baltimore. Roman aureus bearing the portraits of Mark Antony (left) and Octavian (right), issued in 41 BC to celebrate the establishment of the Second Triumvirate by Octavian, Antony and Marcus Lepidus in 43 BC. Both sides bear the inscription "III VIR R P C", meaning "One of Three Men for the Regulation of the Republic". An Indian tribute-bearer at Apadana, from the Achaemenid satrapy of Hindush, carrying gold on a yoke, circa 500 BC. Gold coin of Eucratides I (171–145 BC), one of the Hellenistic rulers of ancient Ai-Khanoum. This is the largest known gold coin minted in antiquity (169,20 g; 58 mm). Coin showing Nero distributing charity to a citizen. c. 64–66. Vespasian sestertius, struck in 71 to celebrate the victory in the first Jewish-Roman war. 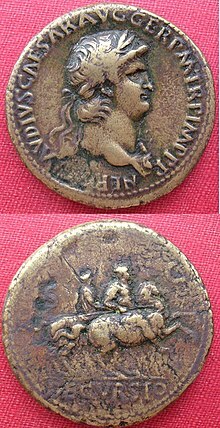 The legend on the reverse says: IVDEA CAPTA, "Judaea conquered". Construction of the Flavian Amphitheatre, better known as the Colosseum, was begun by Vespasian and finished by his son Titus. 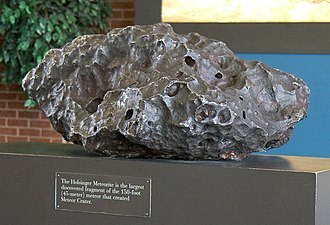 The Holsinger meteorite, the largest piece of the Canyon Diablo meteorite. Uranium–lead dating and lead–lead dating on this meteorite allowed refinement of the age of the Earth to 4.55 billion ± 70 million years. Bust of Antoninus Pius, at Glyptothek, Munich. Denarius, struck 140 AD with portrait of Antoninus Pius (obverse) and his adoptive son Marcus Aurelius (reverse). The temple of Antoninus and Faustina in the Roman Forum (now the church of San Lorenzo in Miranda). 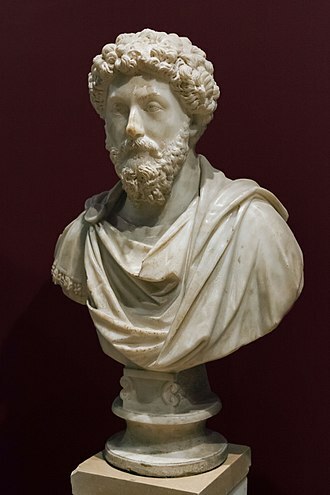 The emperor and his Augusta were deified after their death by Marcus Aurelius. Statue of Antonius Pius in military garb and muscle cuirass, from the Museo Chiaramonti (Vatican Museums). 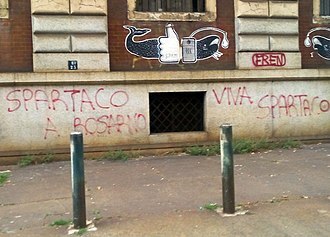 A modern depiction of the fall of Spartacus. Crassus crucified 6,000 of Spartacus's followers on the road between Rome and Capua. 1878 painting by Fyodor Bronnikov. 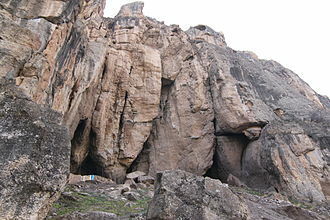 Entrance to the Areni-1 cave in southern Armenia near the town of Areni. The cave is the location of the world's oldest known winery and where the world's oldest known leather shoe has been found. Left: Naked wheat, Bread wheat Triticum aestivum; Right: Hulled wheat, Einkorn, Triticum monococcum. Note how the einkorn ear breaks down into intact spikelets. The campaigns of Tiberius, Ahenobarbus, and Saturninus in Germania between 6 BC and 1 BC.